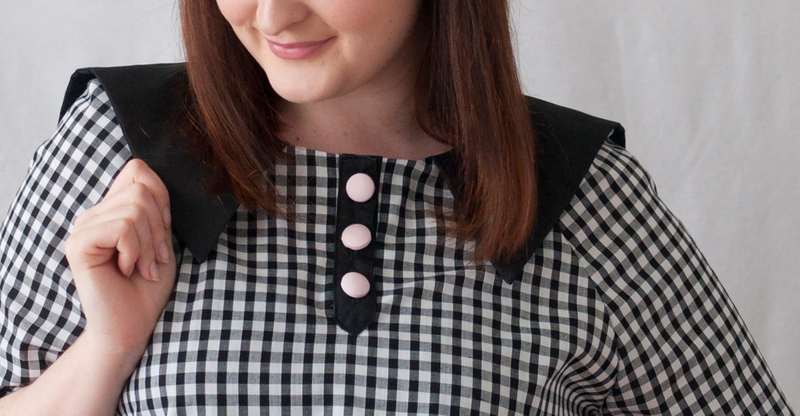 Sew Your Own #1 - Tilly and the Buttons - Coco Dress with Ruffle Sleeve Hack! Hi pinups! 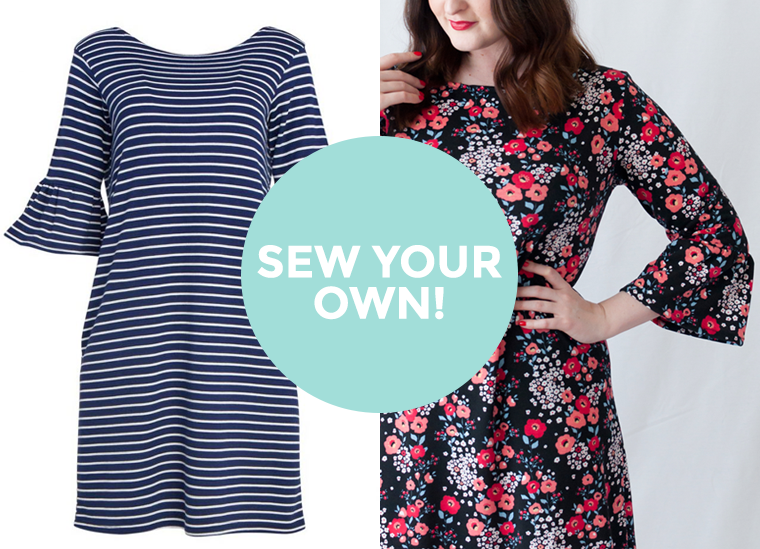 As promised early this week in my Sew Your Own Introduction post, here's my first make in my new blog series. 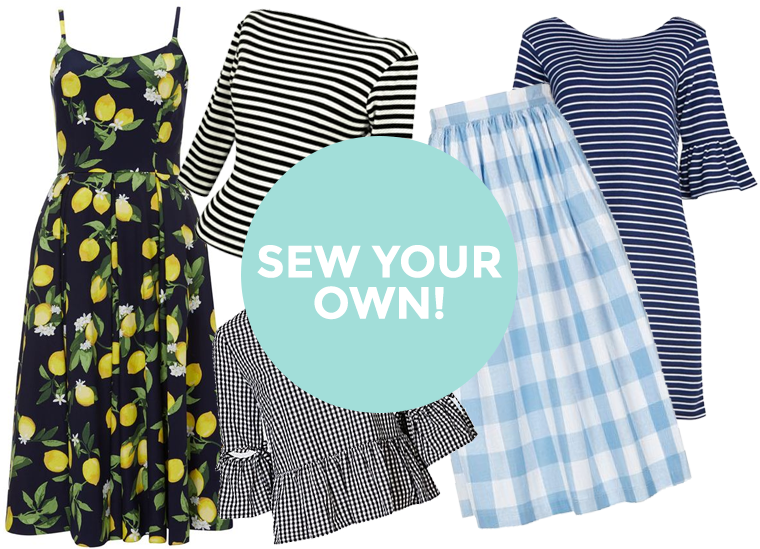 All about how I've recreated some of my favourite ready-to-wear/high-street/online looks myself with handy sewing pattern choices and easy hacks. 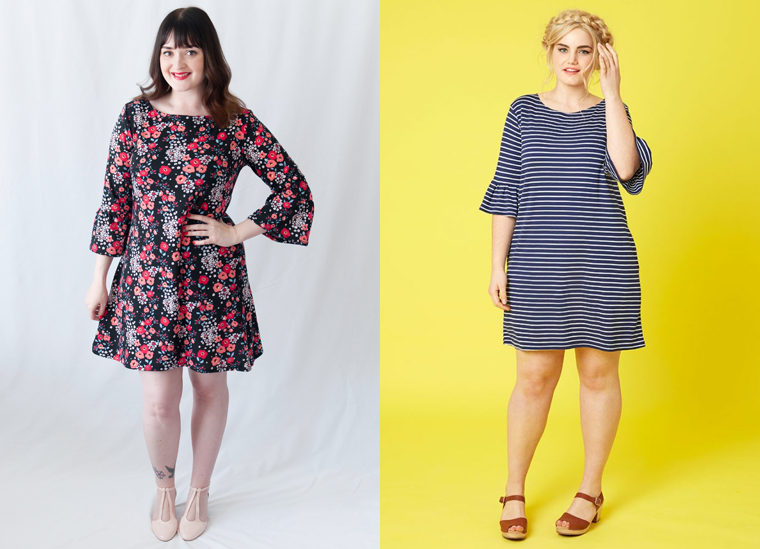 The dress in this post is inspired by the Joanie Clothing Suri Dress. As soon as I saw this dress I knew I wanted one. I love a comfy, simple jersey dress and they're great for this time of year when the weather is sunny one minute and raining the next. 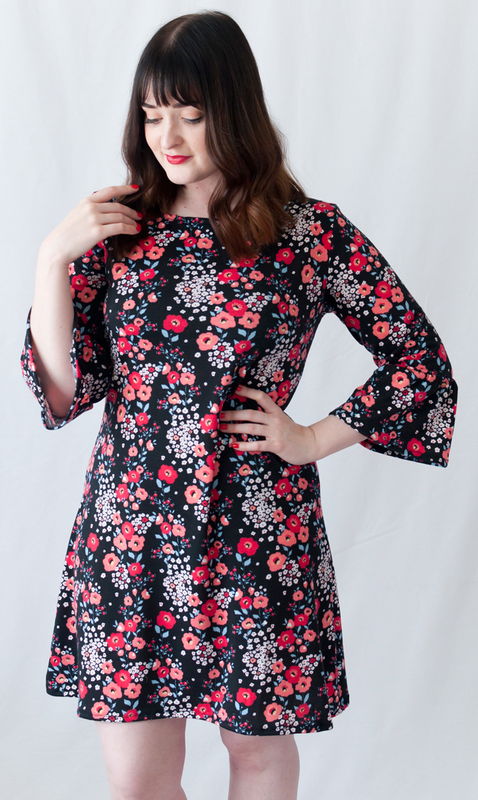 However the Suri dress reminded me instantly of a pattern in my collection and with some recent jersey added to my fabric stash, I thought I'd make my own instead! 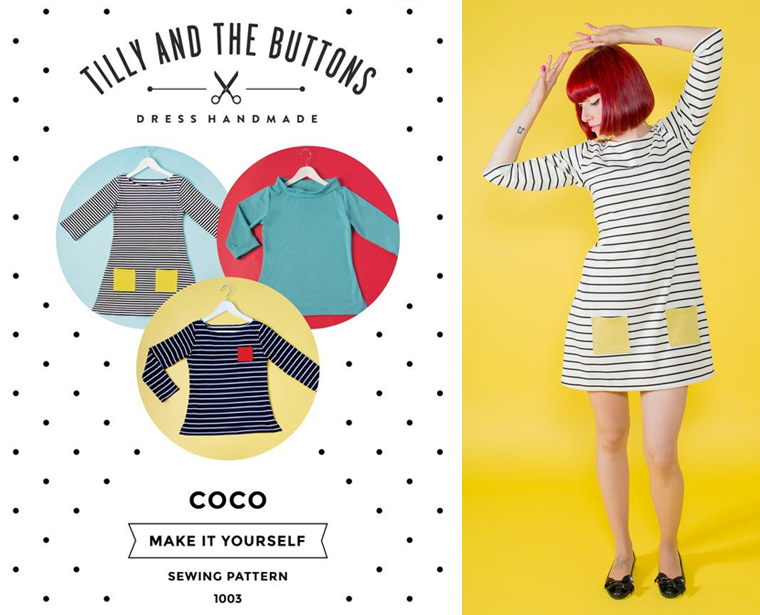 To recreate the Suri dress I used the Tilly and the Buttons Coco dress and top pattern. The body shape is near identical. Along with the simple rounded neckline, pull over style and sleeve options. 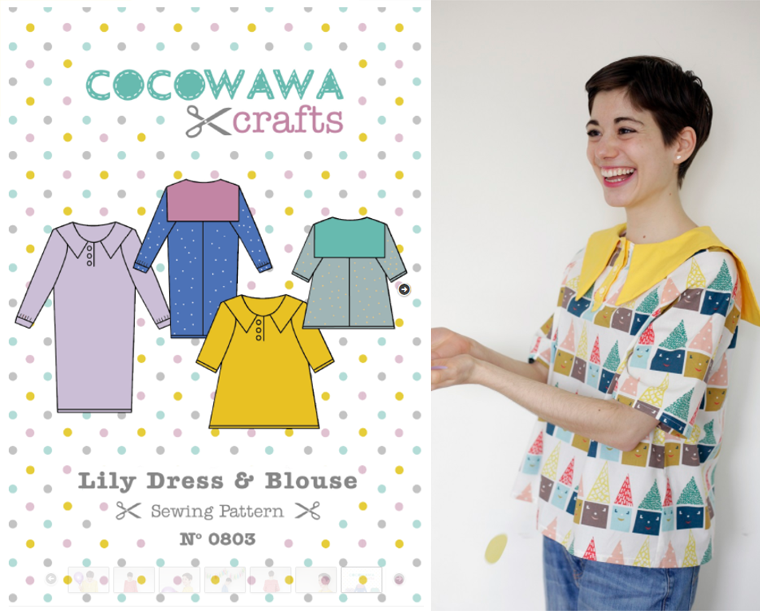 Coco & ruffles - a match made in sewing heaven! The only difference I made for the Coco pattern to get the Suri dress look was adding ruffle/bell sleeve. These are super fashionable right now and I'll be doing a video tutorial this coming week on how to make your own. I didn't think ruffle sleeves were for me but now I see many more in my future! 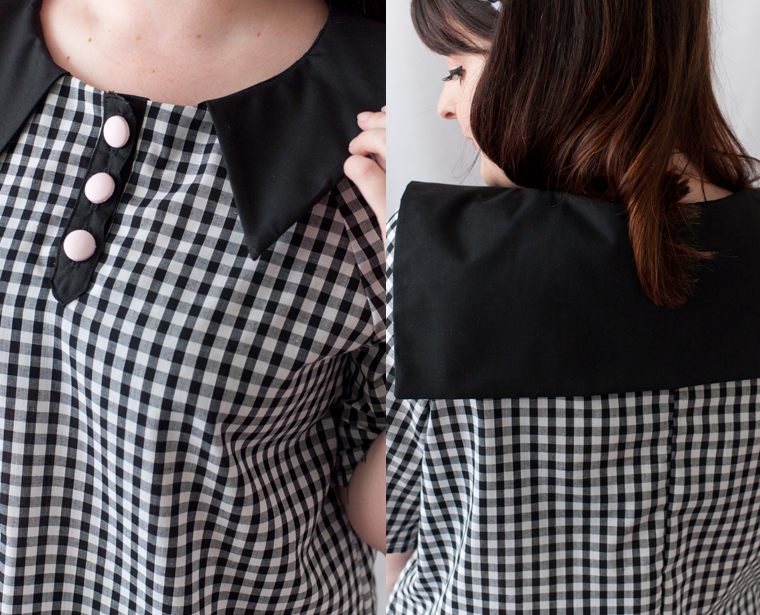 Watch my DIY Ruffle Sleeve Tutorial to see how I made mine! I'm really happy with my finished look. I think it's a great take on the original dress and it's a style I can see myself making again. I've worn this dress a couple of times since I made it and it gets so many compliments. Sometimes simple is best! 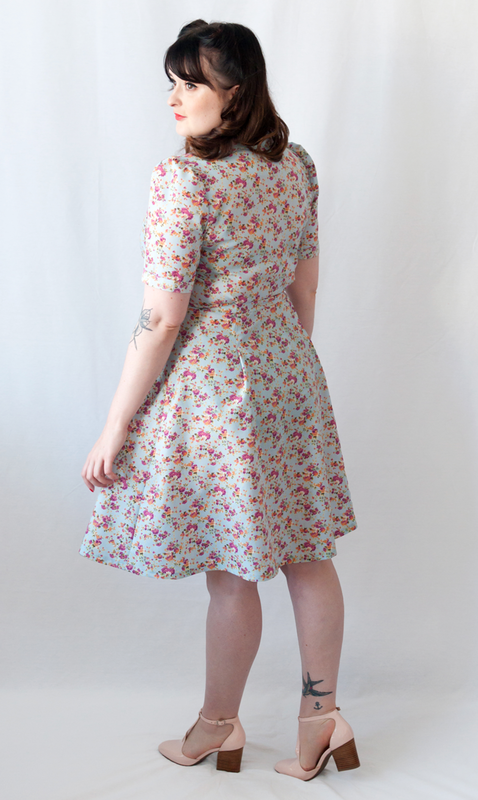 This dress only took me an hour or so to make, and with the fabric only £2.95 a metre and the pattern already in my stash, it was a fraction of the price to make. I love how choosing your own fabric and patterns makes you feel like a fashion designer! Perfect for comfy & smart Spring dressing! 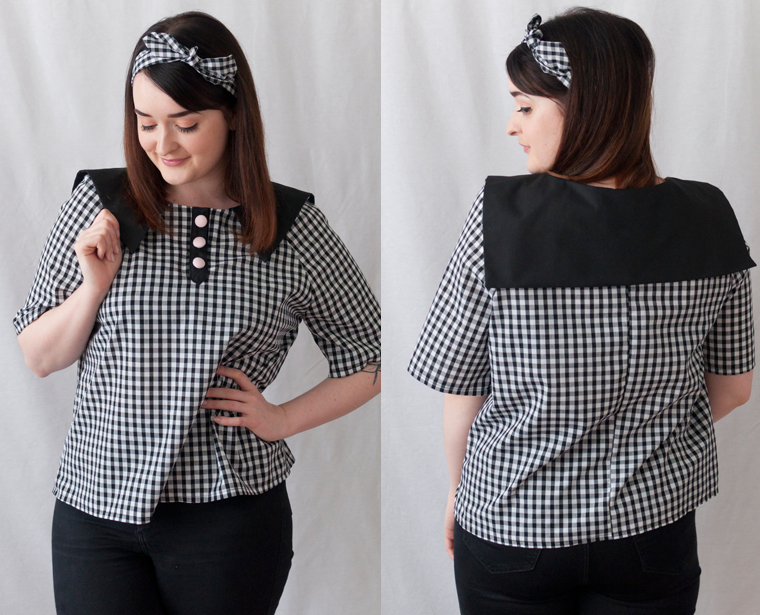 Pattern: Tilly and the Buttons Coco Pattern with sleeve hack (see above). Fabric: 1.5 (ish) meters of floral jersey bought in-store at Barrys in Birmingham. 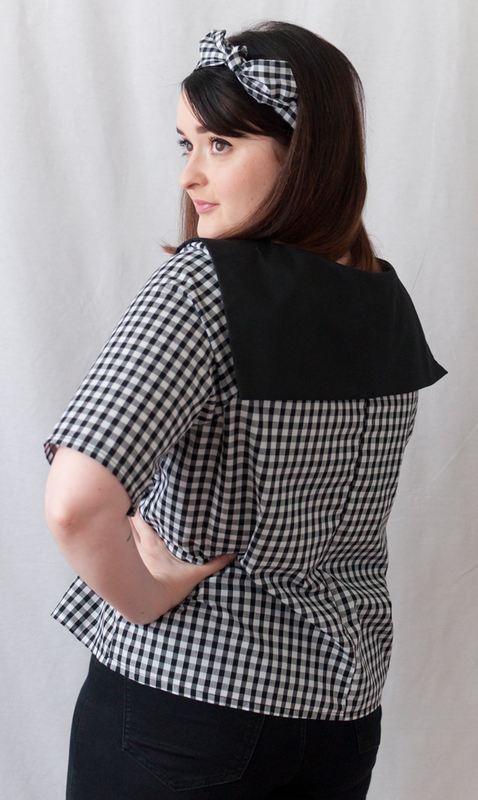 Notions: Ribbon for the shoulder seams. Fit: Spot on, looks just like the dress it's inspired by. Difficulty: So simple, it'd be rude not too! Watch out for: Even gathers on the sleeves. Make again? : I have another ready to go! Overall, I am so happy with this dress! I'm forever looking at RTW clothes and thinking 'I should make that', and I'm glad I've finally started. 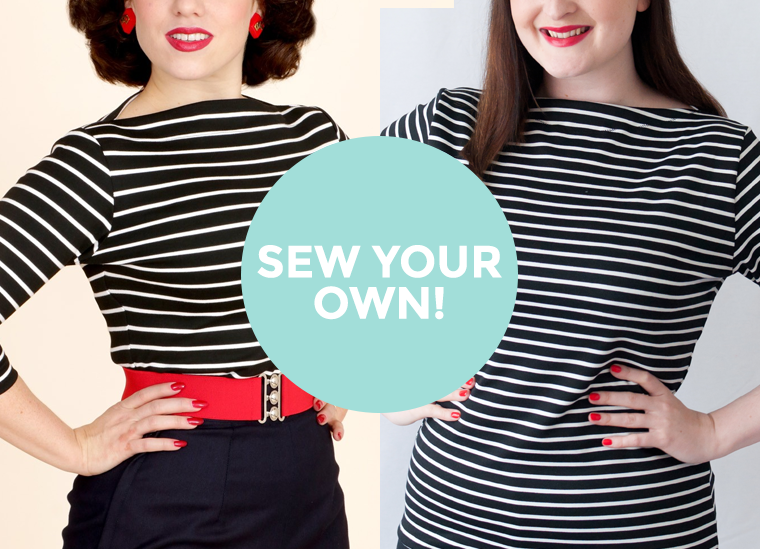 I hope my Sew You Own blog series will also inspire you to start recreating and do let me know if you try this one! 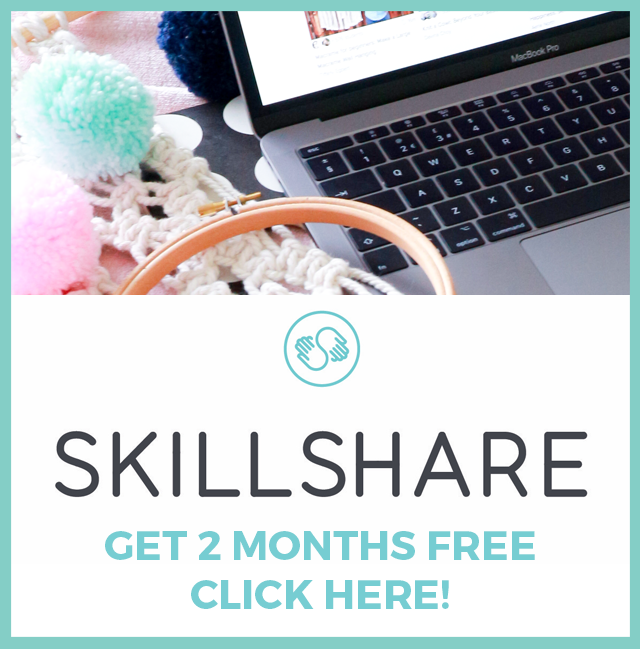 It's time for April's Minerva Craft Blogger Network make! 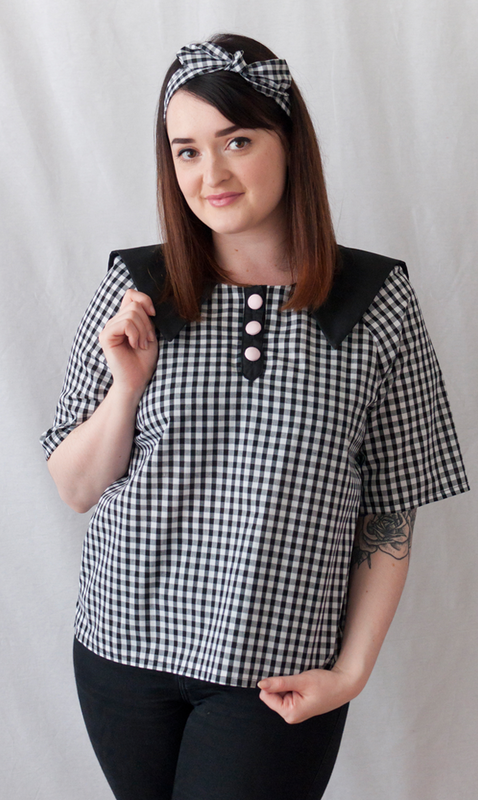 I've been wanting to try Gertie's retro slip pattern for a while now, and after seeing some of her own versions on her Instagram recently, I bumped it to the top of my sewing queue! Sewing time: About an hour! Modifications: I swapped the elastic for fold over elastic. Watch out for: Make sure you make use of the different cup size patterns for the best fit! Make Again? : Yes! I'd love to make all versions of this pattern. You can see this slip in my March Sew & Tell YouTube video HERE! I'm really excited to share my make on The Cocktail Hour Blogger Tour! 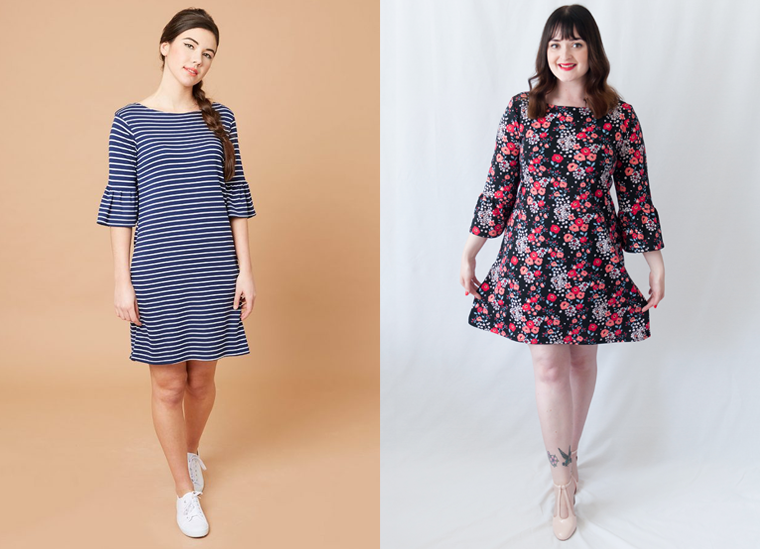 A super fun (and glamorous) sew along hosted by McCalls raising money for The Eve Appeal through the sale of each Vogue pattern selected for the sew along. Stay tuned until the end of this post for my video of the dress in action AND the delicious cocktail recipe! 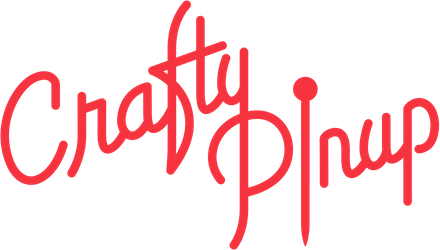 "You can join in with sewists from all over the country to help raise funds and awareness for The Eve Appeal charity by sewing one of the dressmaking patterns from the Cocktail Hour collection. Monies raised from the sale of each pattern will go towards helping The Eve Appeal achieve better detection and prevention of women’s cancers." The Fold Line have put it far better than I can, read HERE. 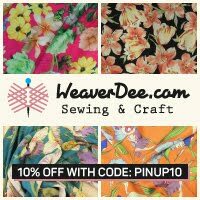 "As the year progresses you can see what everyone else is making by searching for #sipandsew (hehe!) on Instagram and Twitter and of course share your makes too. Post a photo with the hastag #sipandsew and copy in @McCallpatternUK on Twitter or @McCallpatternUK on Instagram. Find out more details from McCall’s about Cocktail Hour here." A fancy dress AND a cocktail recipe? Count me in! I'm not going to lie, I had a pretty hard time choosing from the patterns! I have a wedding coming up in June and I had an idea in mind for the type of dress I'd like to make for this occasion. I don't get much of a chance to sew occasion dresses, so I hoped to combine the two! 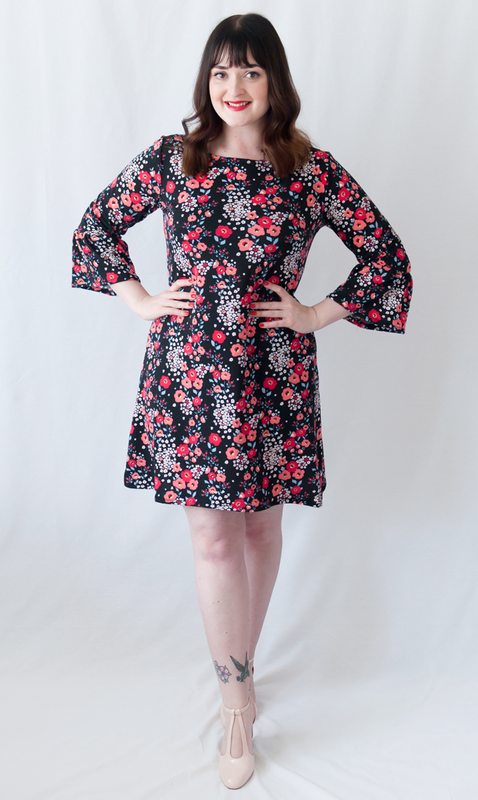 I decided on the V8943 dress pattern. This pattern appealed to me because of the lace overlay, bodice shape and full skirt. 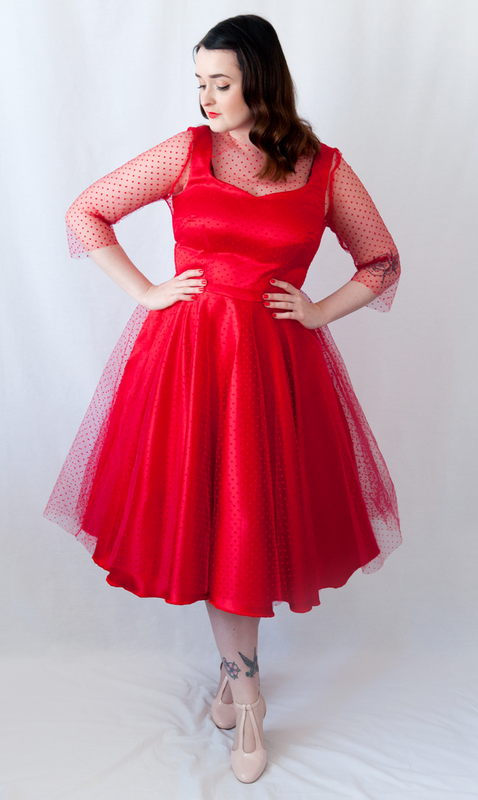 I knew I could use this pattern with tulle fabric instead of lace to create the vintage 1950s effect I wanted. The pattern is made up of two separate garments, the sheer overlay and a slip. I opted not to make the slip, and instead focus on the dress. Feeling straight out of Mad Men! So I decided, if I was making a posh dress, I was going all out. You certainly won't miss me coming your way in this bright red! I searched high and low and found a delicate polka dot tulle on eBay and paired it with THIS stretch satin fabric. I think the combination works perfectly, and the stretch in the satin allowed me to make a super fitted bodice, whilst remaining comfy and soft across my bust. If it were made in a non-stretch fabric, a full bust adjustment would of been needed. 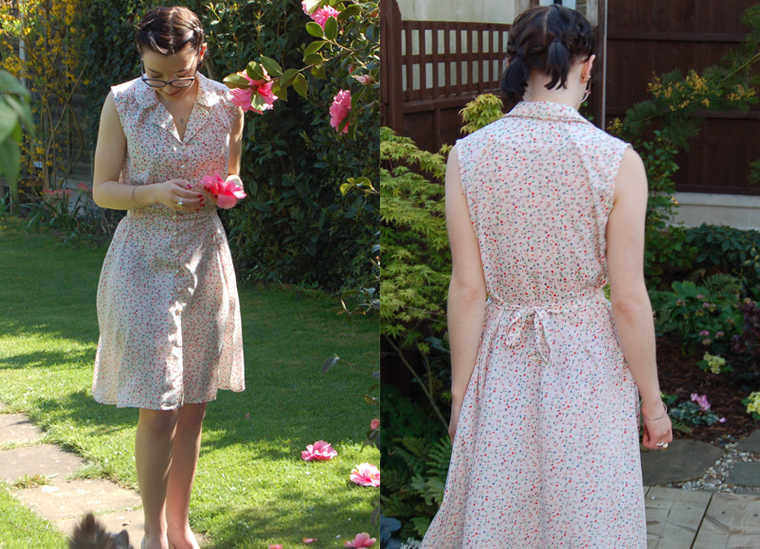 Even though my dress looks quite dramatically different from the pattern, the alterations are actually really simple. The only difference on the tulle layer is that I removed the hip seam. I thought this would look unflattering on me so to keep with the retro vibe, I altered the skirt to a full circle skirt. I also haven't finished the edges on the tulle and have neatly cut it instead. The fabric doesn't fray and I think it provides a delicate looking finish. I finished the inside seams with my overlocker. However, sewing an invisible zip into tulle is not for the faint-hearted and I will be re-doing mine in time for The Dressmakers Ball. 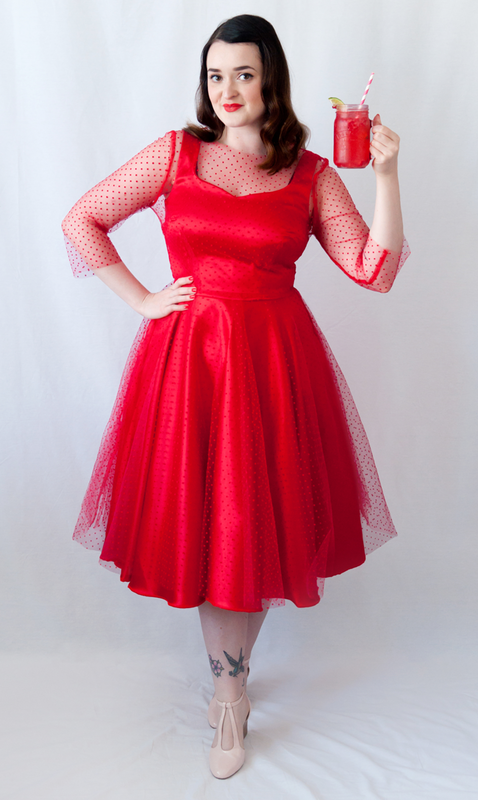 The dress underneath is made from the same skirt and a bodice pattern with exactly the same darts. Leaving a neat finish when the layers are worn together. 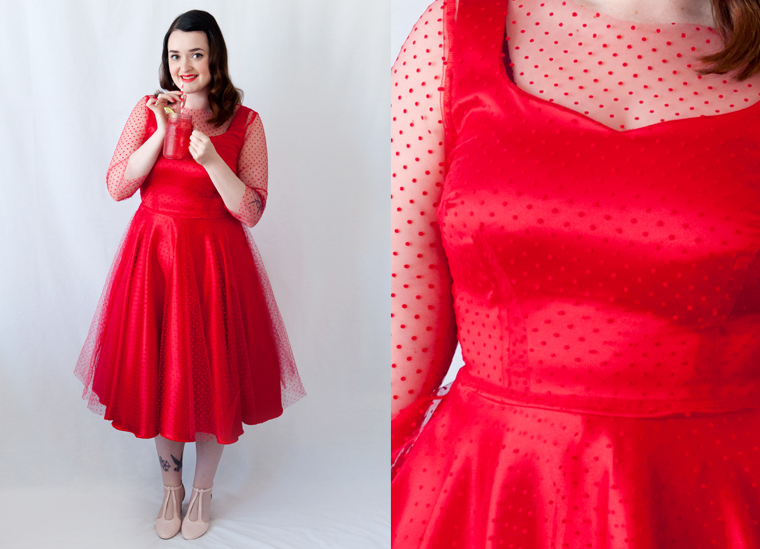 Whilst I didn't follow the pattern's instructions too closely, I love the design and am really pleased the V8943 pattern enabled me to live my Grease party dress dreams! As I said, I hope to wear this dress to The Dressmakers Ball and I will be making a couple of alterations to this dress for the event. I'll be redoing my tulle zip with a longer zip as the tulle dress was a little tricky to get into for this shoot! I'll also be shortening the tulle sleeves to just above my elbow as to not stretch the tulle on my elbows when bent. And lastly, I will be shortening the satin dress slightly, as it falls a touch longer than the tulle which is not what I wanted. I also hope to make a little satin bow belt to finish the look. Then I'll be very happy indeed! Notions: 2 x invisible zips & hook and eye for the tulle. Fit: Great! Fabric choice with stretch meant I didn't need to do an FBA. Phew! Difficulty: It had some challenges, due to my alterations. Great for confident sewists. Watch out for: Too much to mention! Mainly working with tulle. 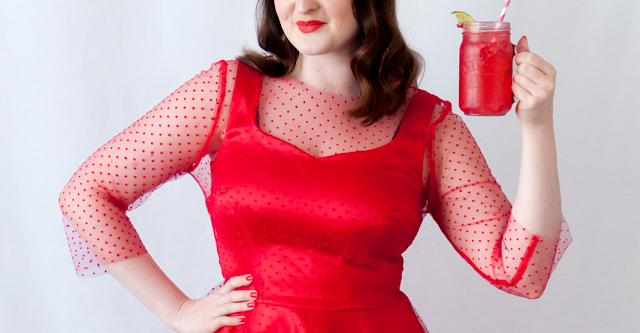 Why yes I am holding a delicious looking cocktail in this photo shoot! And 'yes' you can make it yourself! 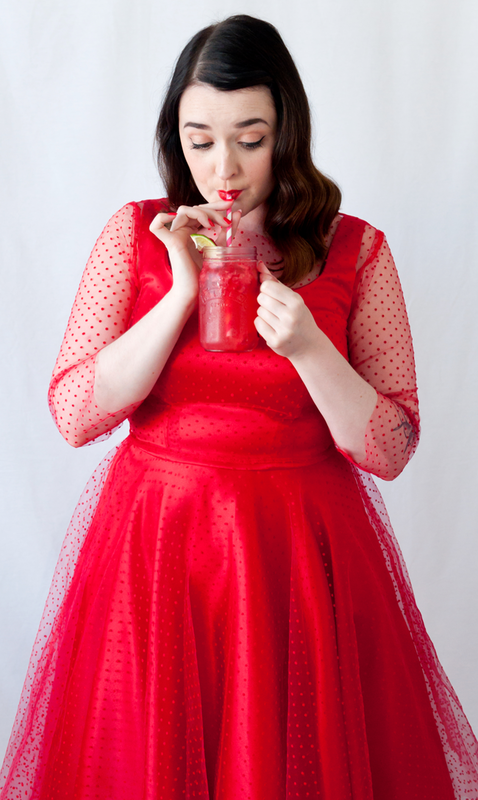 Check out my video below to see my dress in action and how to make this super tasty cocktail! Be sure to let me know if you try the cocktail! Overall I had a great time making this dress. It's been lovely to participate in a sew along with a meaning (and a cocktail!) 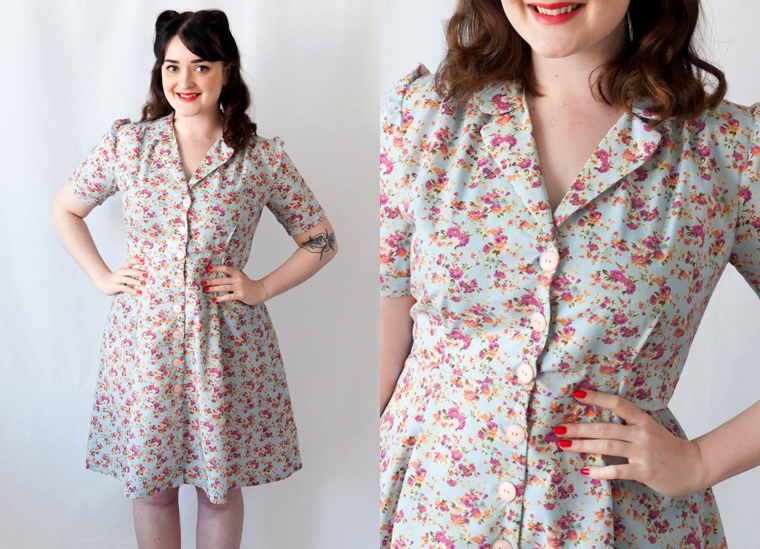 and I really hope I've inspired someone to try the V8943 pattern to create a vintage inspired dress of dreams! It's so fun to wear and whilst it had it's challenges, it was worth it. Will you be taking part in The Cocktail Hour? You totally should do! 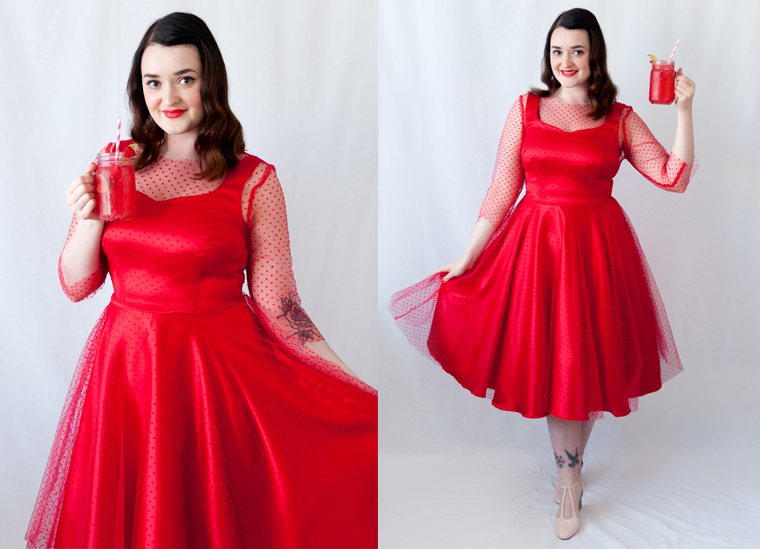 Sewing a fancy dress, raising money for a great cause AND a tasty cocktail recipe? Hell yes. 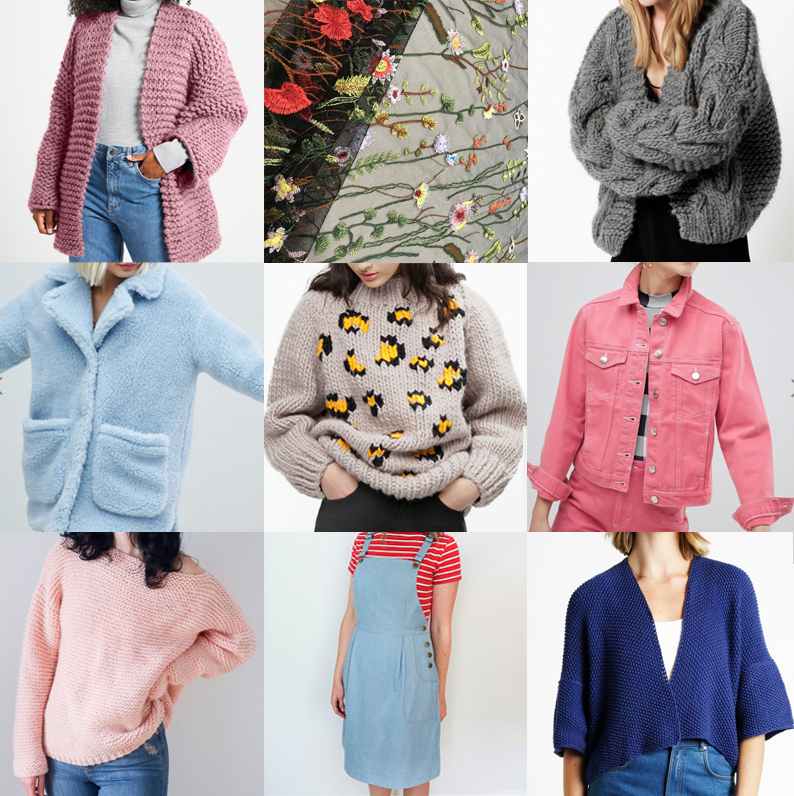 Shop from THIS selection of Vogue patterns to take part. 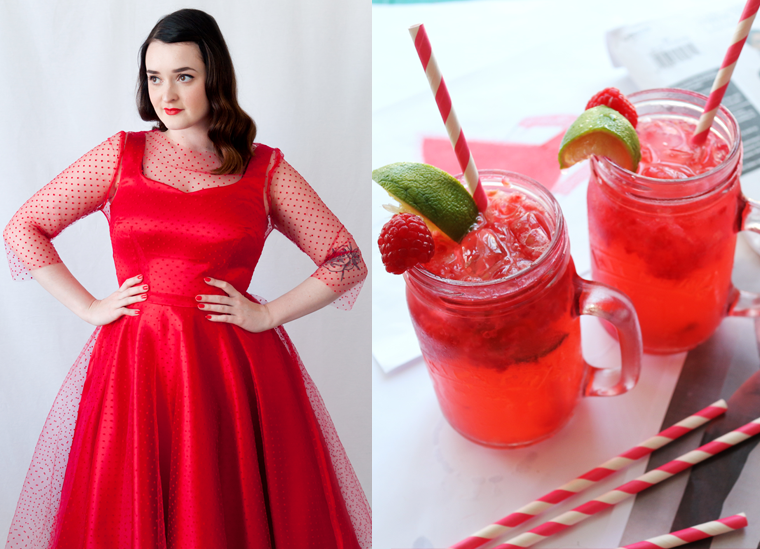 Don't forget to use the hashtag #sipandsew and tag @McCallpatternUK! 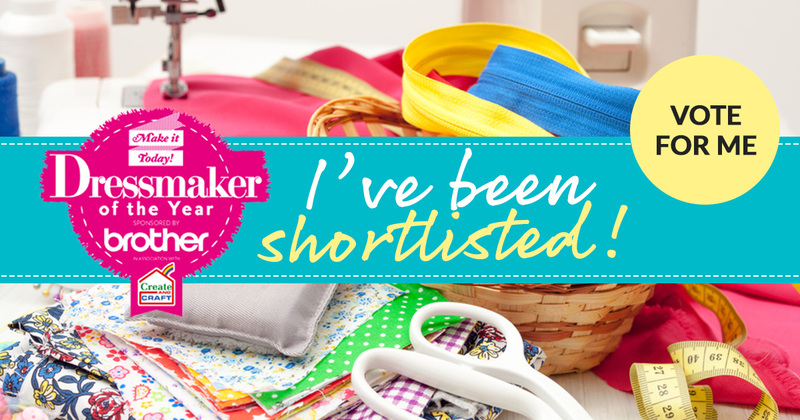 I'm super excited to announce I've been shortlisted for the Dressmaker Awards 2016 in the Vintage category! My garment has headed off for judging (eeeek), but you can also vote for me for the Reader Choice! 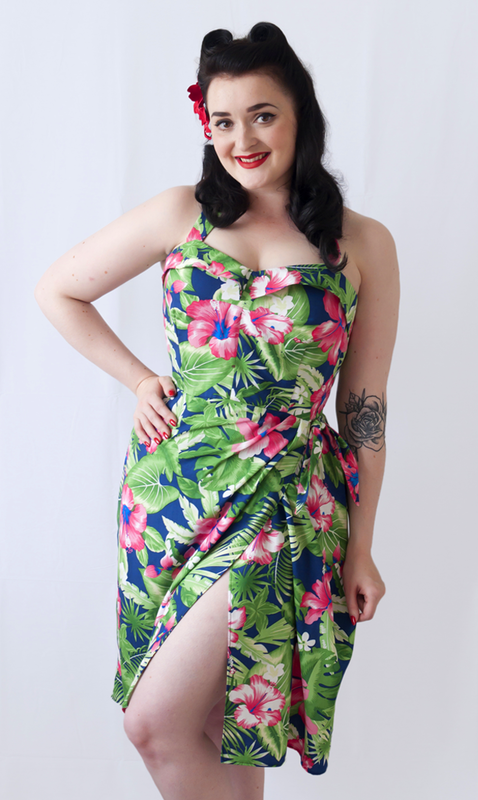 The garment I submitted was my Tiki fantastic sarong dress. I entered this as it was one of my favourite makes from last year. 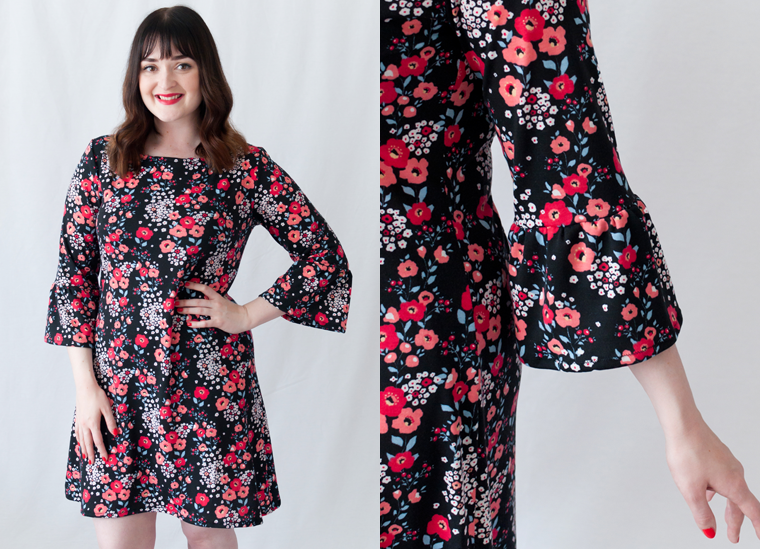 It was my first ever pattern hack, a little out of my style comfort zone, but turned into one of my blog's most popular posts and I had a blast wearing it. It is by no means perfectly made, if I'd of known at the time it would be sent of to be judged, I would've spent a lot of extra care on it. 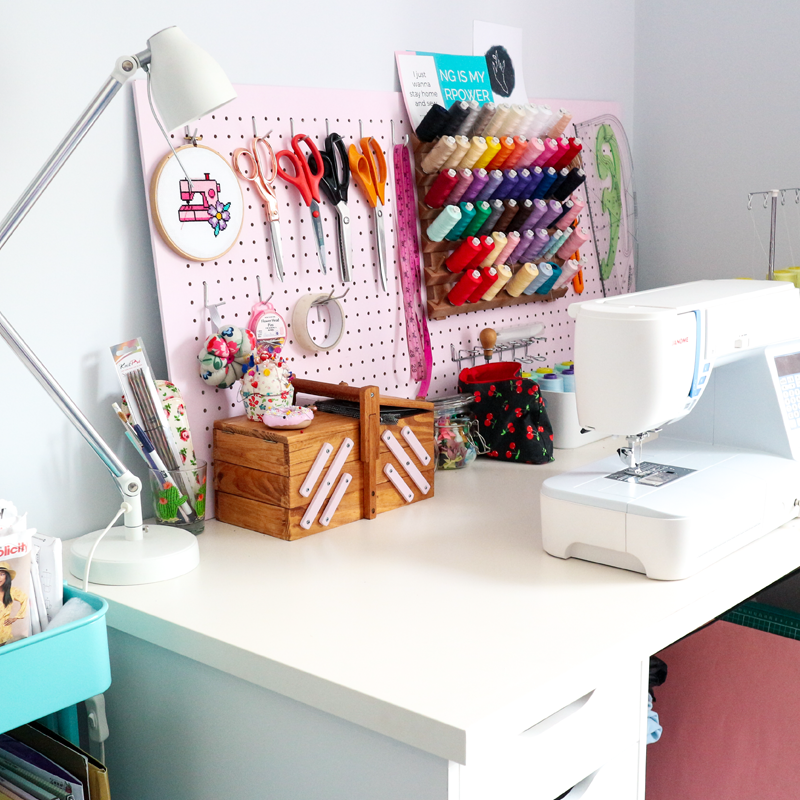 Since I made this, my sewing room has been upgraded massively, including a new machine and mannequin. And hopefully my sewing skills have improved too! So whilst this might not be the technically best made, I love it all the same and I hope you do too! 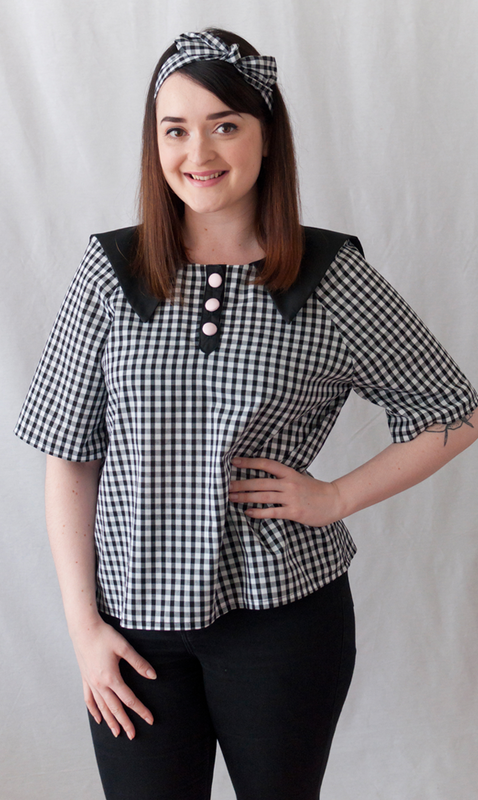 I hope this garment displays my creativity and passion for sewing and retro style! 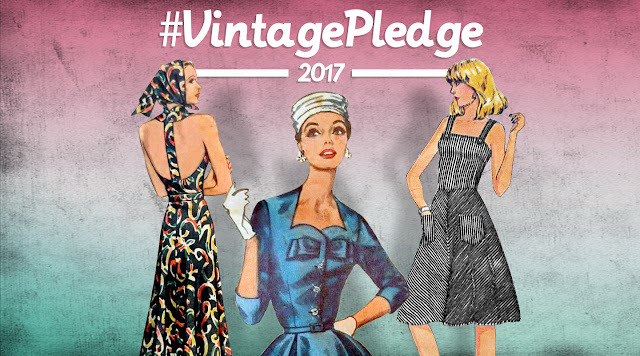 I'm super excited to announce my plans for this year's Vintage Pledge! Hosted by Marie of A Stitching Odyssey. 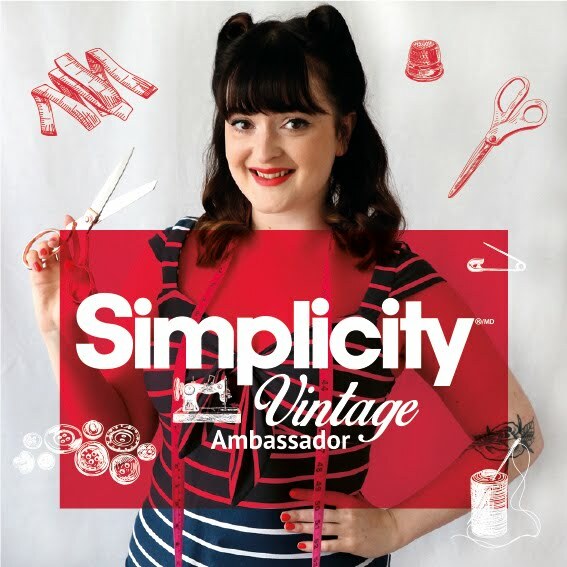 A wonderful vintage style sew along, creating your own goal and spurring yourself and others on to create some beautiful retro garments in 2017! 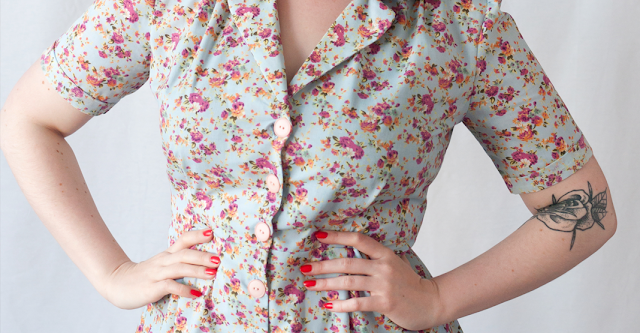 Instead of sewing true vintage, I'll be going down the reproduction route of sewing from reprinted patterns. 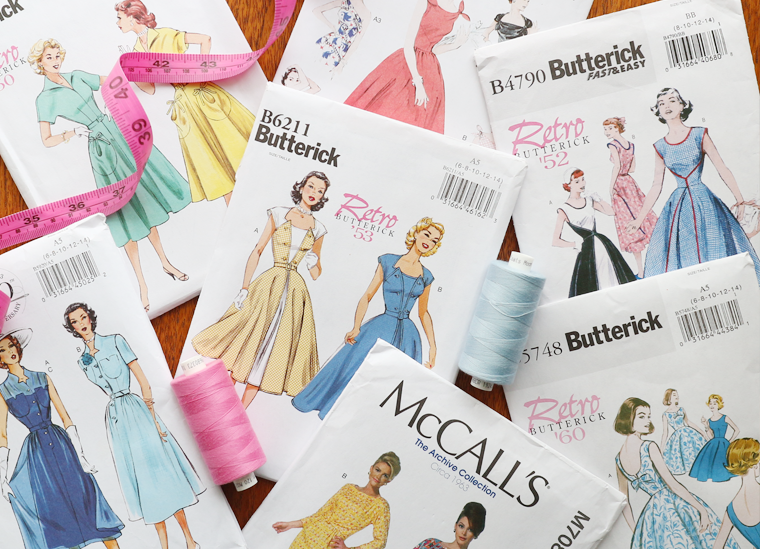 For example the reprinted ranges of 1950s and 1960s patterns which are currently for sale from brands such as Butterick & Simplicity. Some of my Vintage Pledge contenders! 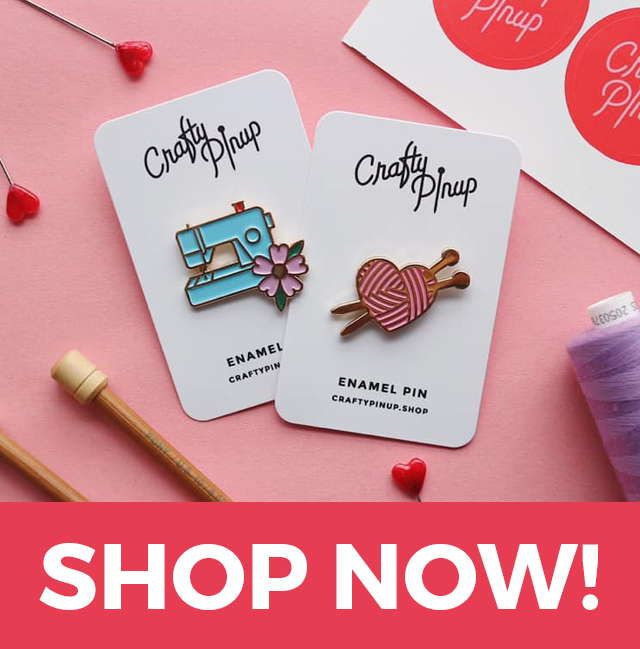 I'm doing this instead of sewing from true vintage patterns, as I just don't have any original patterns in my stash and don't have the time to trawl eBay or Etsy, and my local charity stores & vintage shops are very lacklustre in that department. 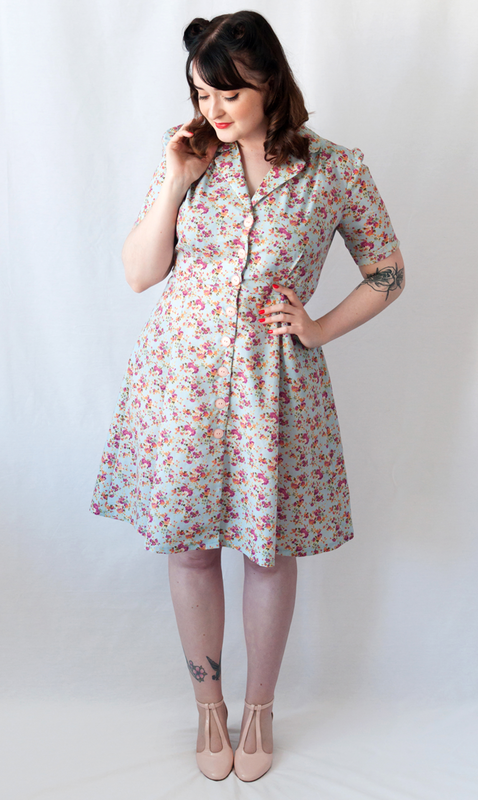 But there are some gorgeous reprinted original patterns you can buy right now to save yourself some time! 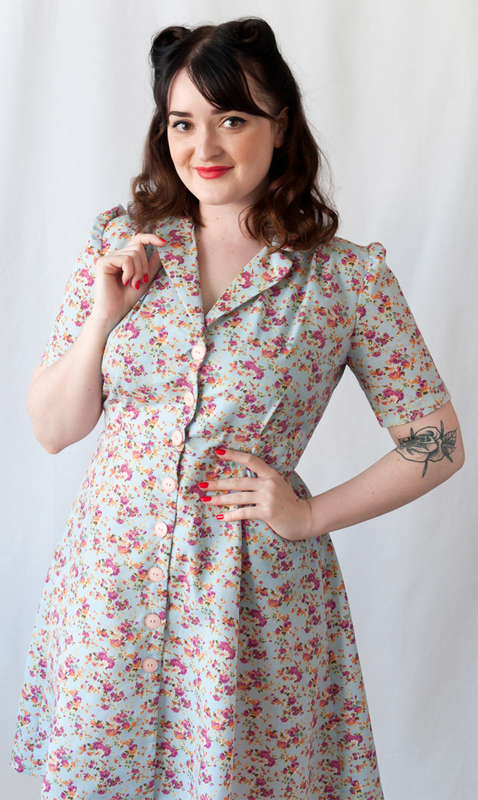 For Summer my favourite era is the 1950s, my goal is to sew a small handful of dresses from reproduction vintage patterns that look like real vintage dresses! I'm obsessed with the fashion on Call the Midwife, so would love to create a small selection of day dresses that could pass for true vintage. 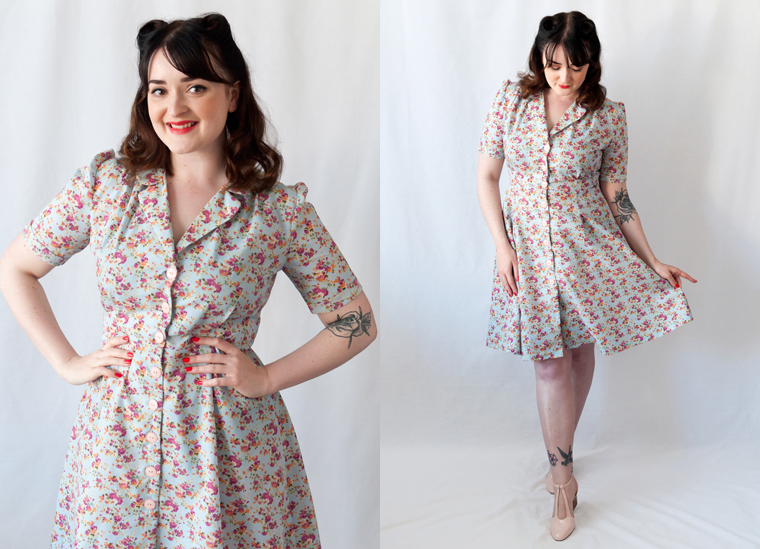 During 2017, I, Abi of The Crafty Pinup sewing blog, pledge to sew at least 4 reproduction vintage dresses! 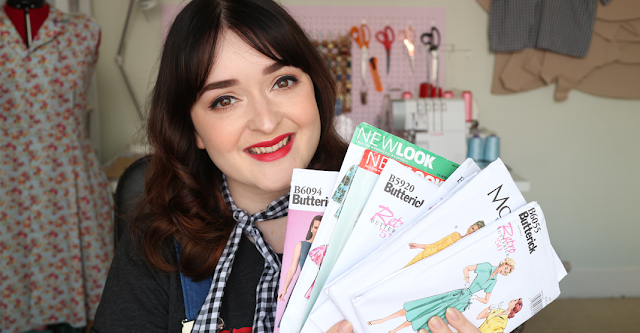 You can also see me talking about my Vintage Pledge plans along with showing you what else was in my recent pattern haul in my latest YouTube video! Will you be taking part? What is your vintage pledge?